Buick has been trying to capture a younger demographic and add some excitement to its brand for quite some time. With Tiger Woods in the doghouse and no hip celebrity endorser, what’s one to do to reinvigorate a brand that never seems to produce cars on anyone’s wish list? Well, that my friends, is where the new Buick Regal GS Concept comes into play. While GM has not given the green light for production, this car looks pretty much ready to go. Most of the major components are already being cranked out anyway. And with so many detailed specs available, this alone leads us to believe it is a shoe-in for showrooms. Of course, the mass-market Regal CXL models will probably get a fair head start (this summer) before the GS drops, but we’ll wait patiently. The Regal GS is based on the Opel Insignia OPC, the model’s high-performance variant, which sports a turbo V6 good for 325 horsepower. But given that the Regal platform will use the same 2.0-liter EcoTec four-banger of which we’ve become quite familiar, GM’s engineers had to put on their tuning hats. As such, the reworked GS engine will reportedly pump out 260 horsepower. That’s a nice number but it’s really the 295 lb-ft of torque that raised our brows along with the fact that a six-speed manual will be offered. As another sign of the performance aspirations of the Buick Regal GS, the General turned to Brembo to work up a serious braking system. Their request was answered in the form of 14-inch cross-drilled rotors, 4-piston mono-block aluminum calipers and high-performance pads. Interestingly enough, GM also figured that to get any respect as a performance car, staying with the platform’s current front-wheel drive setup just wouldn’t do. Luckily, it’s based on Opel’s Epsilon II architecture and was built to work with the Haldex torque vectoring system. Therefore, the GS will deliver a very advanced and adaptive all-wheel drive system. And an electronic, limited-slip differential will make sure engine power is correctly distributed during spirited driving. Personally, I haven’t seen a Buick that was desirable in longer than I can remember. 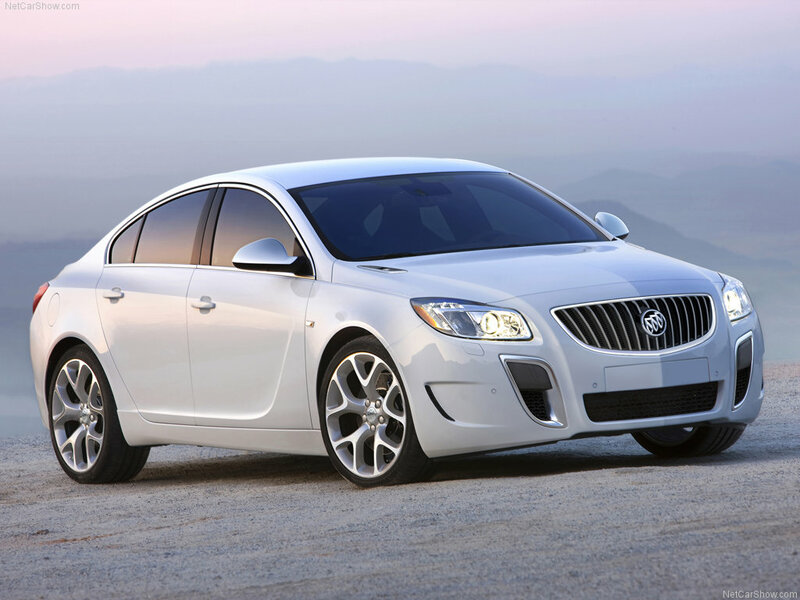 That said, the exterior and interior design of the Buick Regal GS has made me look twice. With two additional vertical front air intakes and the dual-exhaust pipes in the back, it’s evident that this thing means business. Inside, the racing-inspired sport steering wheel and metal pedals create a much closer relationship between driver and car than in the past. And the Recaro high-performance front seats featuring 4-way lumbar support and cushion extensions will keep the front occupants snug and comfortable when ripping through turns.